New Horses have arrived !! All horses of the same breed have the same statistics, regardless of color. A detailed listing of current breeds and there location can be found via the Horse Breeds menu above. Prices vary between 300 and 1500 Star Coins. You are not able to sell your original Jorvik Warmblood. Bought horses can be sold at stables around Jorvik. Selling a horse is possible only when all tack as been removed. Think long and hard before you do sell a horse, receiving only a few thousand Jorvik Shillings is much less then your initial outlay. The positive, selling will free up stable space for more horses. How do you buy a new horse? Click on the individual horse to bring up the information window, the purchase button and sale price are located at the bottom. Once purchased, the horse will automatically be transported to your Home Stable and will vanish from the store. Don't worry, another horse of that color and breed will return the next time you log into the game, making it possible to have more than one of the same horse. Don't have enough room in your stable? Is taking care of all your horses taking up too much time? Horse Island will allow you to send horses on a little vacation! A boat will take your horse out to a beautiful island pasture where they can relax and run free with some new horse friends! When you want your horse back from the island, simply make sure you have space available in your stable, and at your request your horse will make the trip back fully rested and happy after their vacation. To change horses is easy, just climb on the one you want to ride. Note! Only one horse can be taken out of the stable at any given time. To change your horse’s equipment, you have to be mounted on the horse you want to change. All of your horses have to be cared for at least once a day or they will become sad, even if you don’t ride them. Strength - How high and far a horse can jump. Discipline - How well a horse responds to commands. Agility - How fast a horse changes direction. * Discipline, Swiftness and Agility are the top three stats to focus on, when maximum speed is your goal. A Horse Trainer has Arrived!! 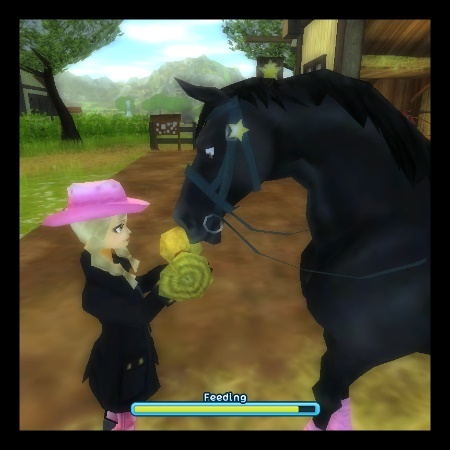 As of the 7th August 2013 you can hire a Horse Trainer to level up your horse! 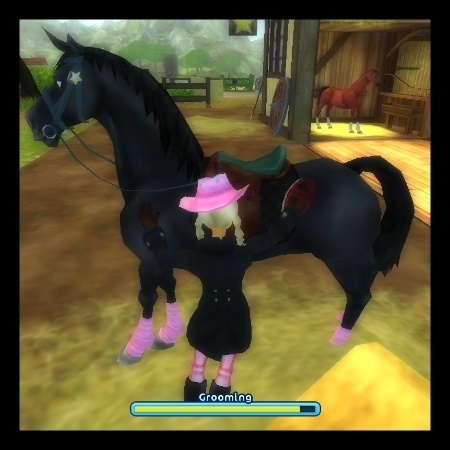 The horse trainers are located near the Fort Pinta Stable area and at Jorvic Stables in Harvest Counties, they train your horse so that it gains another level. The higher the level of your horse the more the trainer has to work on training it to get to the next level. This is why the higher levels cost more than the lower ones. The horse trainer can only help one horse each day.